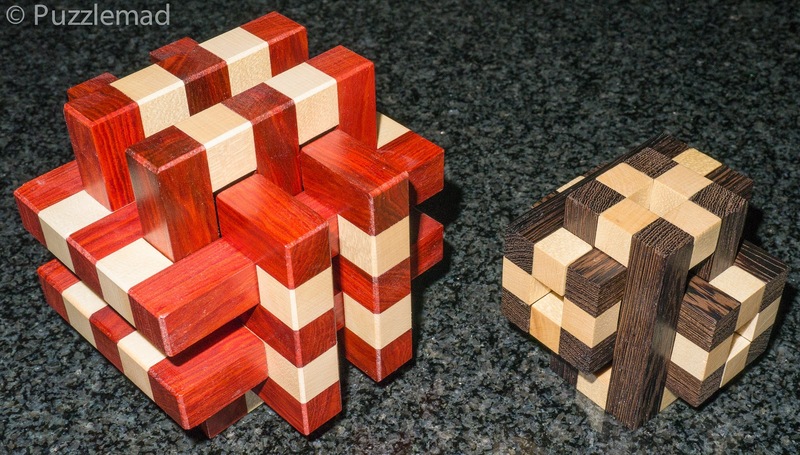 Puzzlemad New Additions: Burst my budget! But I can't resist more wood! Burst my budget! But I can't resist more wood! At IPP I actually burst my budget and was very lucky that I had a good few puzzles as gifts from friendly puzzlers! Shortly after returning from IPP there were updates from Brian Menold and Eric Fuller! Prices do seem to have crept up over the years but they have to earn a living - I couldn't buy everything that I wanted (which, of course, was EVERYTHING) but I couldn't resist picking up a couple of gorgeous puzzles from each of them! The first to arrive is pictured above - we have Luna and Nembus 2 from Brian, both designed by the incredible Yavuz Demirhan. Brian has very recently had a change of fortune and been forced to turn to puzzle making as a full time job and with pieces of this quality, he WILL succeed! They are absolutely gorgeous and the workmanship is stunning - it's as good as any I've ever seen! Fabulous! No wonder I couldn't resist! Just arrived today is the Accordion 3.5 and Simultaneous maze from Eric. I did try to get something else but it was snatched out of my basket as I entered my credit card details! :-( These were both designed by the relative newcomer, William Hu. He seems to have burst onto the scene with lots of really interesting designs and Eric has made quite a few of them! Now I really do have quite a backlog of puzzles to solve - it will be hard but I will cope!